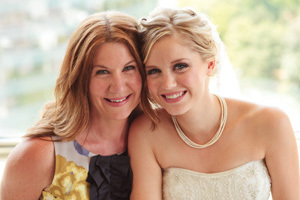 I recently read the book HOW I PLANNED YOUR WEDDING by Susan Wiggs and her daughter, Elizabeth Wiggs Maas about a completely relatable story of a mother and daughter planning the daughter's wedding. From the very first sentence, i was entertained. Both writers have such distinct voices, yet combine to make a story that any woman can see themselves in similar situations. Sure, while my mom was not 150% involved in all my planning, I could still relate to the mother's narrative because now that I'm a wife, and hopefully one day a mother - my next role in a wedding will be the glamorous but not too overly done Mother of the Bride. Since I love weddings and all things truly sappy and about love (in any form), I just enjoyed the book thoroughly and am so happy to say that I get to give three of my readers the same opportunity to read this all too entertaining, hysterically funny and just downright touching story between a mother and daughter and wedding planning! All you have to do is leave a comment on the blog, and if you have a funny or memorable moment from your own wedding planning OR a fear of what wedding planning may do to you and your mom's relationship, pleae share ! Make sure to leave your contact info, so that if you win i can let you know! And if you tweet about it, leave a comment too - that'll give you an extra entry !!! Contest will end Next Thursday on February 10, 2011 (11:59PM EST) and I'll announce a winner on Friday! Just in time to get y'all pumped for the upcoming wedding season! 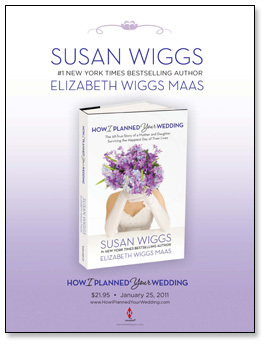 ﻿ #1 New York Times bestselling author Susan Wiggs and her daughter collaborate on a funny, charming, and poignant book about the trials and tribulations of planning the daughter’s wedding together. Combining the narrative talents of two gifted writers with invaluable practical advice, this book is both an entertaining read and a must-have resource for any mother or daughter in the throes of wedding planning. I'd love to read this book. Sounds like a fun read! My daughter and I didn't run into many troubles, and seeing how so much has changed since I got married - I almost felt relieved to leave the big decisions to her. I did a destination wedding to preserve my sanity and my mom's too! I would love a chance to win this book. I plan on getting married this summer, what a nice book to read. Blushing Bride! I can't wait to read this. I have two daughters I'll be planning weddings for and I'm excited to see your adventure. Sounds interesting! I'd love a copy! I'd love for a chance to read this book.